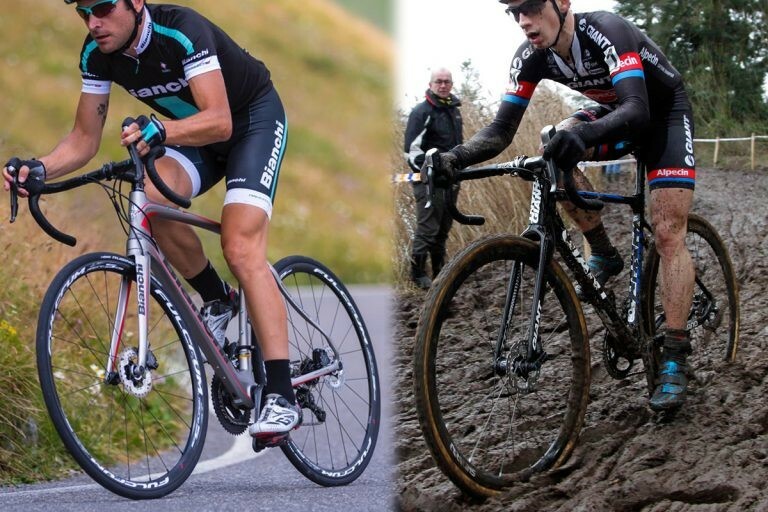 It can be tricky to spot the differences between a road bike and a cyclocross bike on appearances alone. On closer inspection, there are significant differences which give very contrasting rides. Cyclocross bikes use a more upright riding position with a longer wheelbase than road bikes. Whilst a side-effect of this is greater comfort & stability, the main intention is to give the rider better control over the bike on challenging surfaces. Along with the upright ride position, many cyclocross bikes have a higher bottom bracket height as well. This adds extra ground clearance for clearing obstacles, and to raise the rider’s feet away from the mud. Cyclocross bike frames & forks are also wider to accommodate for bigger tyres with chunky tread. The top tube is flatter, with the underside shaped to make it easier and more comfortable to carry over a shoulder – a requirement for some cyclocross course obstacles. To accommodate the larger tyres with knobbly tread, cyclocross bikes have wider rims than road bikes too. Aerodynamic shaping of the rims is considered less important on a cyclocross bike, so the emphasis is more on strength and weight. Modern Cyclocross bikes predominantly use disc brakes, thanks to their performance advantages and that they are further away from areas where mud collects on the bike. However, it is not uncommon to see cyclocross bikes with traditional style cantilever brakes, which are favoured by many professional racers for their weight advantages. Gearing on cyclocross bikes comes from road bike groupsets like Shimano Tiagra, 105 and Ultegra, with the main difference being the use of an ultra compact 46-36t chainset, and (model depending) a wide-range cassette. Cyclocross bikes often contend with short, steep hills and rarely achieve road-bike levels of speed. Due to the nature of a cyclocross bike’s design, they’ve become highly popular with commuters looking for fast, comfortable and easy to ride road bikes. For that reason, many entry-level cyclocross bikes are supplied with relatively smooth tyres, and have mudguard & luggage rack mounting points integrated into the frame.